Bolton Takes Helm on US National Security at Time of Tumult - Integration Through Media ....! (VOA): The U.S. military is bracing for a possible strike in Syria. Preparations for a high-risk North Korea summit are barreling forward. The White House staff is on edge, unsure who will be fired next, and when. And the national security team is holding its breath to see whether their new leader will be a shock to the system. Enter John Bolton, the pugnacious former U.N. ambassador who took over Monday as President Donald Trump's national security adviser — the third person to hold the job in barely 14 months. Trump's selection of Bolton last month set off a guessing game in Washington as to just how much of an imprint his take-no-prisoners approach to foreign policy will have on Trump's team, already beleaguered and exhausted after a tumultuous first year. If Bolton had any first-day jitters, he had little time to indulge them. A daunting to-do list has awaited him, punctuated over the weekend by a suspected chemical weapons attack by Syria's government that led Trump to start exploring potential military retaliation. Although Bolton didn't formally start until Monday, he was spotted entering the White House over the weekend, carrying an umbrella as he strolled down the driveway toward the West Wing on a rainy Saturday. And on Monday, he appeared at his first Cabinet meeting, where Trump talked up his forthcoming meeting with North Korean leader Kim Jong Un, chided China for taking advantage of the United States and condemned the "atrocious" chemical attack in Syria. Bolton didn't speak, but was seated prominently behind Trump as reporters were briefly allowed into the meeting. "I think he's going to be a fantastic representative of our team," Trump said later in the day. He pointed out the fact that Bolton was starting in the midst of an urgent situation with Syria, adding: "Interesting day." Inevitably, Bolton's past statements in public jobs and as a Fox News commentator follow him into the job. At the White House press briefing Monday, spokeswoman Sarah Huckabee Sanders was asked about a comment Bolton made in 2013 on Fox and Friends — he said he would have opposed an authorization to use force in Syria. "The point of view that matters most here at the White House, as you well know, is the president's," Sanders replied. Next to go? Apprehension outside the White House about Bolton's influence has been matched by hand-wringing in the West Wing about whose fortunes will rise and fall as the new national security adviser takes charge. In Trump's reality-show-infused White House, it's become a truism that when a powerful aide departs — like the chief of staff, national security adviser or a Cabinet secretary — others who were considered aligned with that aide are often the next to go. There have been many such shake-ups, even in just the past few weeks. And Bolton, in his former jobs at the U.N. and at the State Department, developed a reputation as someone who doesn't suffer fools quietly. Even before Bolton started, rumors were circulating about potential exits on the national security team. The night before Bolton started, the White House said National Security Council spokesman Michael Anton would be departing, a high-profile public face of national security team. The White House said Trump thanked Anton for his service, but his departure marked another moment of upheaval in an administration marked by months of in-fighting and high-level departures. Although it's unclear whether Bolton will "clean house," two U.S officials and two outside advisers to the administration said that the White House has been considering a significant staff shake-up in the part of the NSC that handles the Middle East. That comes as Trump prepares for a key decision next month on whether to withdraw from the Iran nuclear deal, the 2015 accord that Bolton has long derided. 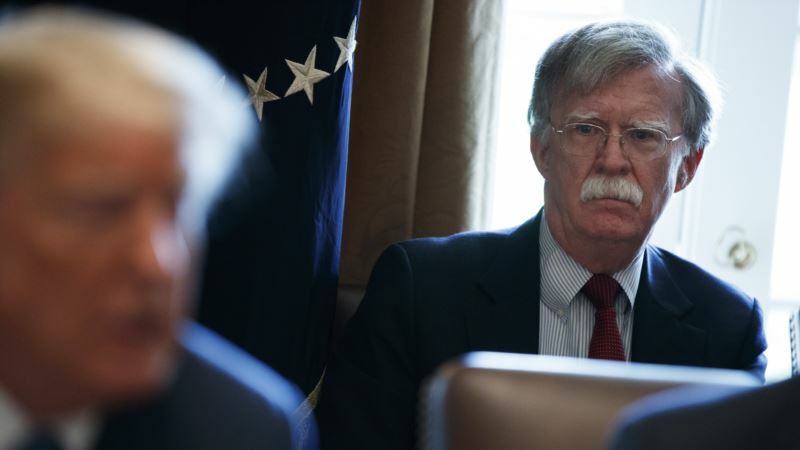 Traffic cop In the weeks since being named to the post, Bolton has quietly sought to calm concerns that he would push a more militaristic, hawkish approach on the president, considering his previously expressed support for pre-emptive military action against North Korea and regime change in Iran. Although he stayed out of the public eye, showing deference to outgoing national security adviser H.R. McMaster, Bolton privately told some foreign embassies and influential foreign policy experts that he planned to approach the job more like a traffic cop, guiding a decision-making process in which the president can hear competing views, said individuals familiar with those conversations who weren't authorized to discuss them and requested anonymity. Frank Gaffney, a longtime Bolton associate and former Reagan administration official who runs the far-right think tank Center for Security Policy, said Bolton views his role as "to help the president get his program implemented." Bolton has been "preparing his whole life to be in this job," Gaffney said. Yet in his 2007 book Surrender is Not an Option, Bolton reflected on his decision to take a job at the U.S. Agency for International Development after President Ronald Reagan was inaugurated rather than work at the White House, out of concern his own voice would not be heard. "Being on the White House staff was fun," Bolton wrote. "But I wanted 'line' responsibility — to manage something and to change it, not simply to be 'staff,' even at the White House." Bolton's start comes after the tortured exit for McMaster, Trump's second national security adviser, a three-star general who never developed a strong personal bond with the president. While the White House said McMaster's exit had been under discussion for some time and stressed it was not due to any one incident, it came after months of speculation about his future in the administration.